← Dining Room Reveal: Use What You Have Decorating! Though Dwell Home, Amy Butler, or Ty Pennington fabrics may catch my eye, the budget guides my wallet, and, frankly, budget wins over designer pattern lust any day in our house. Since I already had the necessary heat bonding tape on hand (though I had to scramble a bit to find it), the grand total of the cost of my DIY curtains was …. Yup. A mere $2.99 for some lovely little vintage curtains. I was shopping in Goodwill and grabbed this sheet and carried it around with me while I was shopping so nobody else would claim it. (You know, to protect my prize from all the other DIYers teaming about the place hoping to make their own curtains from that very same vintage sheet. Obviously.) Before I did anything rash the hubby would regret (let’s face it: that’s a very feminine print), I texted this message and photo to Daniel. Me: "Could you live with this until we can afford more expensive curtains? I think it is pretty." Daniel: "Sure." Sweet! He approves! That lovely sheet was mine just a few minutes later. So let’s get to the really juicy part … the tutorial. First of all, I must give credit where credit’s due. I never would have realized I could use clips to make any fabric I wanted into a curtain, were it not for the amazing Petersiks over at Young House Love. I probably wouldn’t have attempted a no-sew project of this scale, either. But I did, and I think it turned out pretty well. So thanks, Sherry and John! 1 vintage full or queen-sized flat sheet in good condition. Optional: 1 handy helper. Mine came in husband form. Thanks, Babe. Wash and dry the sheet, being careful to remove it from the dryer or clothesline before it wrinkles. If you have a helper, fold the sheet in half length-wise, holding it parallel to the ground. If you don’t, lay the sheet on the floor or a table and fold in half in a similar manner. Hold the folded end of the sheet in one hand and cut down the center of the fold until you have two equal-sized pieces of the sheet. I did this while Daniel and I both were still holding the sheet above the ground and I just walked toward him, keeping the fold intact while cutting. 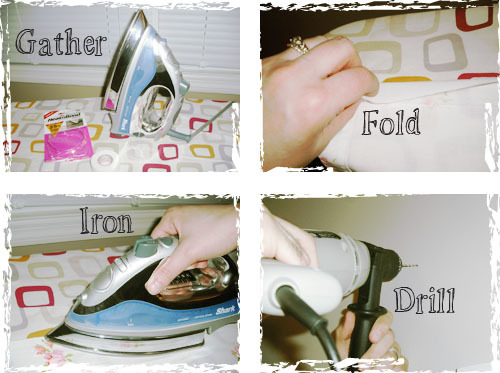 Place one half of the sheet on the ironing board so that it runs length-wise. Set your iron on the dry “silk” setting. Turn the sheet over and press the hem from the other side for 3-5 seconds, as well. Lay flat while repeating steps 1-7 with the next half of the sheet. The curtains are now completed! 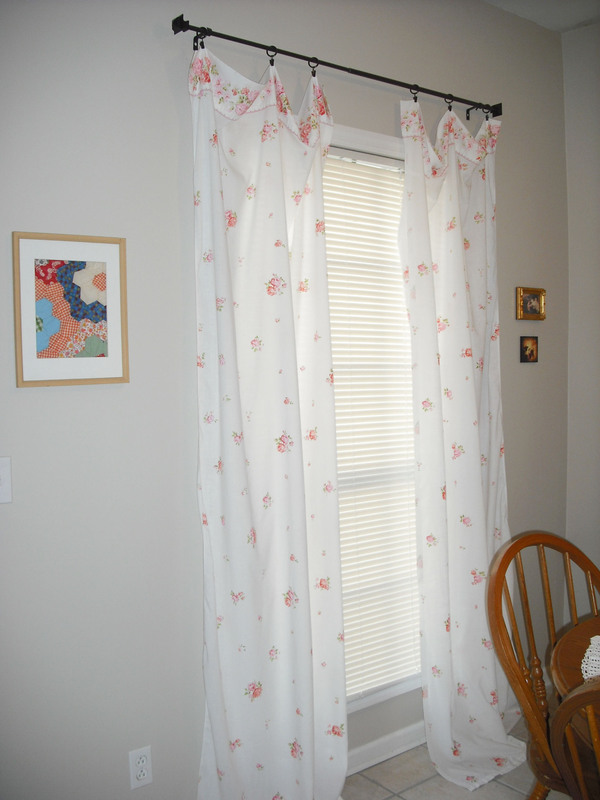 Use curtain clips to attach them to your curtain rod. I thought one package of clips from Target would last me for both sides of the curtain, but I was wrong. They look too sparse and the folds of the curtain are too deep for my taste. I plan to go back and get more to complete the look I am trying to achieve. I was fortunate enough to be able to place my curtain rod high enough over the window to allow the curtains to just barely pool on the ground. If you’re like me and have to install the curtain rod at the same time as the curtains, the immensely helpful tip that I learned from Young House Love was to clip the curtains to the pole and raise it all to the level you desire and mark that spot to drill your holes. 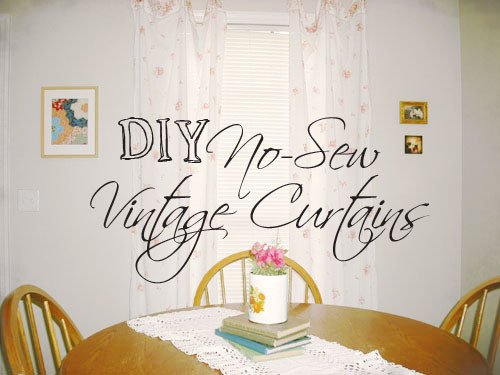 If you are not able to do this, or prefer a more tailored look, clip the curtains on the rod and determine how much needs to be chopped off the ends. Then just cut and hem those up with the bonding hem tape, as well! One final note: my personal preference led me to choose to hang my curtains up with the wide decorative hem at the top, by the rod. If your preference is different, just hang them upside down, instead. Maybe going the no-measure, no-sew way was cheating, but I really love my pretty dining room curtains. I can’t wait to show them off to dinner guests! LOVE IT! can’t believe they are no-sew!! so easy! thanks! 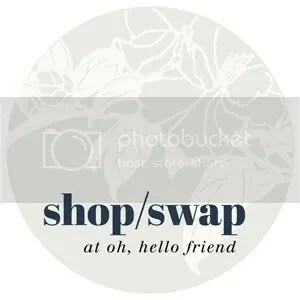 I absolutely love this idea. So pretty, light, and airy. 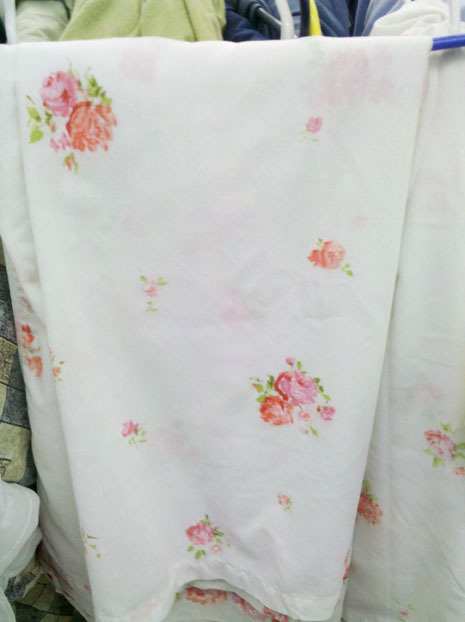 I am going to keep my eyes peeled for adorable vintage sheets.